Pursued previously reported C-bit problem. (Was being written as 1, but always read as 0.) Discovered a loose screw lodged in the pin array of the drive's read amplifier card gate. It was lodged between the output pins of the C-bit's read head! Removed screw. The signal from the C-bit was now present, but weak. The output signal of the C-bit's read head was measured at 10 mV(p-p). All other bit signals were 30 mV(p-p). Discovered shredded tape residue on the inside track of the read portion of the read/write head. Cleaned head and the drive's tape path. C-bit's signal improved to 30 mV. Tried to run the VRC diagnostic. (The one that originally detected the C-bit error.) The 1402 card reader would not read past the first card. The correct data was being loaded into locations 1 through 11 (the only columns used on first card), but the first instruction was not being executed. It seemed that the I-STAR was not having correct parity set in the thousands digit for location 1. The C-bit was set 0 rather than 1, all other bits were 0. Switched to hand code loops for debug. Wrote entire tape with 20-character standard (even) parity records. Read much of the tape back correctly. No errors. Tried to read back records using odd parity read instructions. Expected VRC errors on every record. Received VRC errors on some, but not all records (about 50%). Wrote entire tape with 20-character odd parity records. Read much of the tape back correctly using odd-parity read instructions. No errors. Tried to read back records using standard (even) parity read instructions. Expected VRC errors on every record. Received VRC errors on some, but not all records (about 50%). Whenever the "tape error" did not occur, the 1401's A-register indicated bad parity even though it contained correct parity and data. I suspect a bad signal level in the error detect circuitry. The 1402 problem I reported is not "gang punch" related. I believe the bug is in the 1401 CPU address generation circuitry. > on the 729 and TAU circuits. > Definitive progress towards a working tape drive! > p.s. Sorry to hear about your 1402 reader problem. I just read your log entry about the 1402 problem when there are lots of holes in the card. This was a common problem with all card readers that used read brushes to flip cores. It first showed up on the 714 card reader after the Column Binary feature was installed to read binary cards. 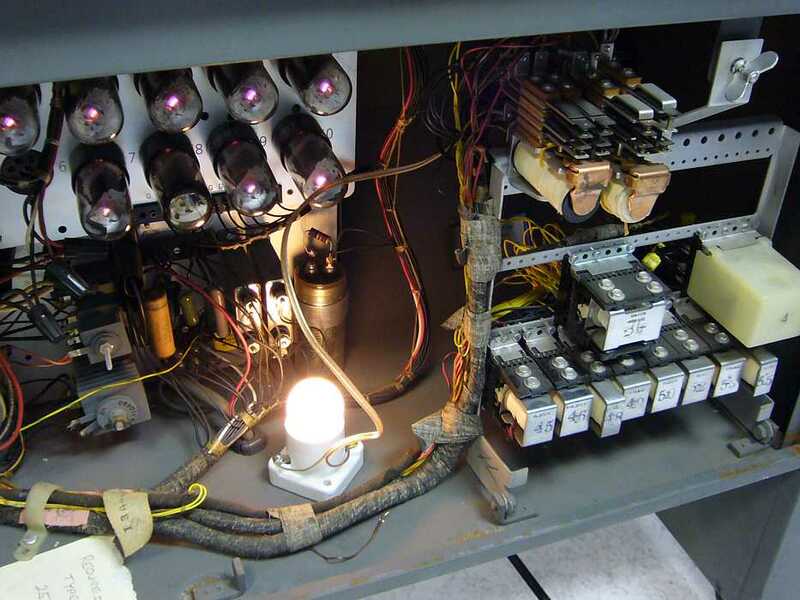 The most common cause was low voltage getting to the contact roll. This could be caused by low voltage out of the power supply or anything causing high resistance from the supply to the roll. 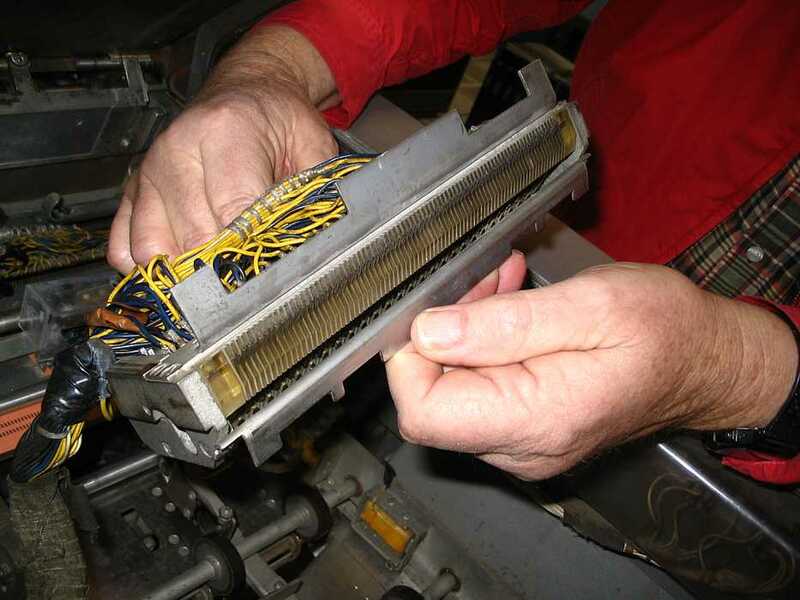 Some of the causes were worn or burned common brushes, loose screws in terminal blocks and frayed or broken wires. I wrote a detailed story about my first encounter with this problem in my story # 23 Chinese Binary. The best way to see if this is your problem is to put one scope probe on one of the brush wires where it plugs into the connector block. Put the other scope probe on the output of the voltage supply and run some cards that have all the holes in the 4 row punched. When the 4 row feeds past the read brushes you will see a square wave and can measure the voltage on the roll. If it is much different than the supply you can move the second probe along the wiring path from the supply to the common brush and tell where the difference occurs. The row bit cores are in the 1401 array and I marked with red where the -20 attaches. There is a chart on page 42.40.53.2 that shows the actual pin connections to the array. 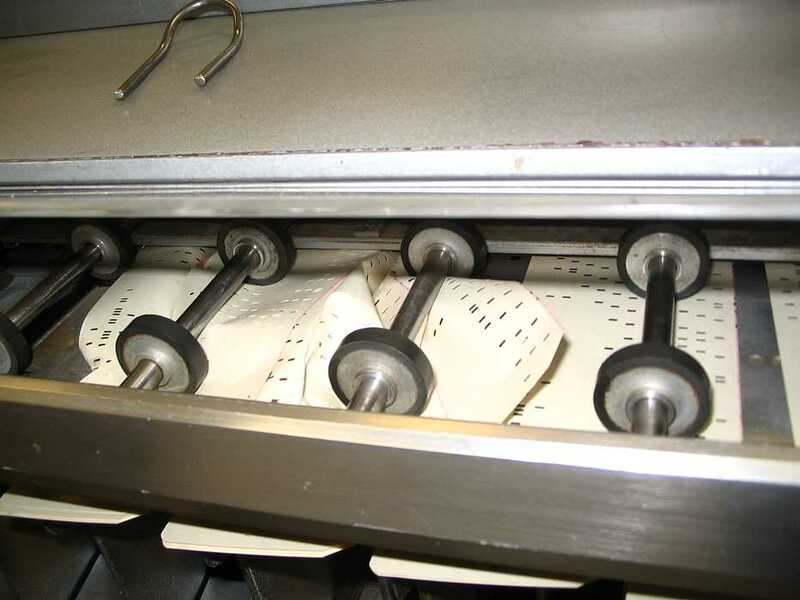 Also marked is a note that says, "Machines with serial numbers above 25000 have 1/2 write line removed. This allows the row bit core to set with full I from read brush". ALD page 42.40.51.1 has a chart that show the connections between row bit cores and the read brushes. There is a note at the bottom of this chart that says, "All brush signal lines have a 180 ohm series resistor before 01A1 edge connector termination on the paddle card connector". I wondered if this resistor value is the same for all serial number 1401s. When they did away with the 1/2 write line how did they increase the current through the brush? Assuming no other resistance 21 volts through a 180 ohm resistor = 117ma. If you have all 80 columns punched in the same row that's 9.3 amps from the supply and through the transistors driving the common brush. Any resistance in the common circuit could explain why it fails when there are lots of holes punched. A 9.3-amp pulse to our old 1402 21V power supply could be our issue. I'm not familiar with required core switching currents (in general, and wrt 1401). Is 117 mA already a marginal value? The only cores that I actually knew what the switching currents were in the 737 memory on the 704. We had to scope the terminator resistors for the X and Y array drive lines and look for a voltage level that represented 410ma +or- 10ma. These X and Y drive lines only went through the hole in 64 cores one time. We did not have any vacuum tubes that could supply this amount of current so that's why they used switch cores to drive them. As cores became smaller with less mass it took less current to flip them. The cores in the 7302 memory on the 7090 could pass through the hole in a 737 core. Then the 360 cores could pass through the hole in the 7302 cores. What does it mean to "remove 1/2 write line"? If you look at the left hand red arrow on the attached diagram you will see it points to a line labeled 1/2 write * that goes from the power transistor up through a resistor then over to the right and down through the row bit core. 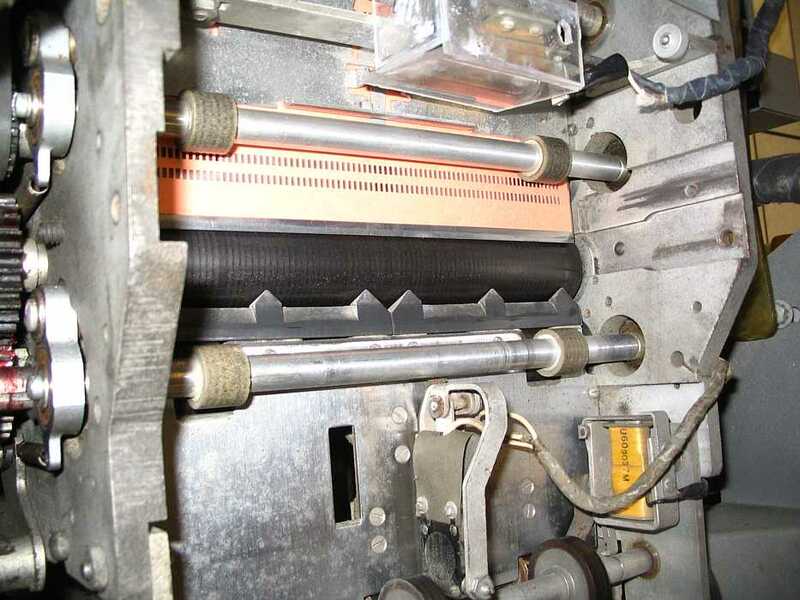 This is the line that was removed on the 25000 serial number machines. This would certainly help reduce the cost of the array as these were all hand wired at that time. There is a second line from the power transistor through the read brush then through a resistor then to the row bit core. Notice that when this line goes through the core it is wrapped around the core several times then to the -20 volts. The extra turns help flip the core with less current. I suspect it will help us immensely again. > array drive lines and look for a voltage level that represented 410ma +or- 10ma. to find out what's wrong with our extended core memory. > the read brush then through a resistor then to the row bit core. is used to flip a core in main memory! in a noisy environment due to nearby elevators, etc.). Present were Ron Williams, Bob Erickson, Allen Palmer, Frank King, Glenn Lea, Chuck Kantman, Ed Thelen. 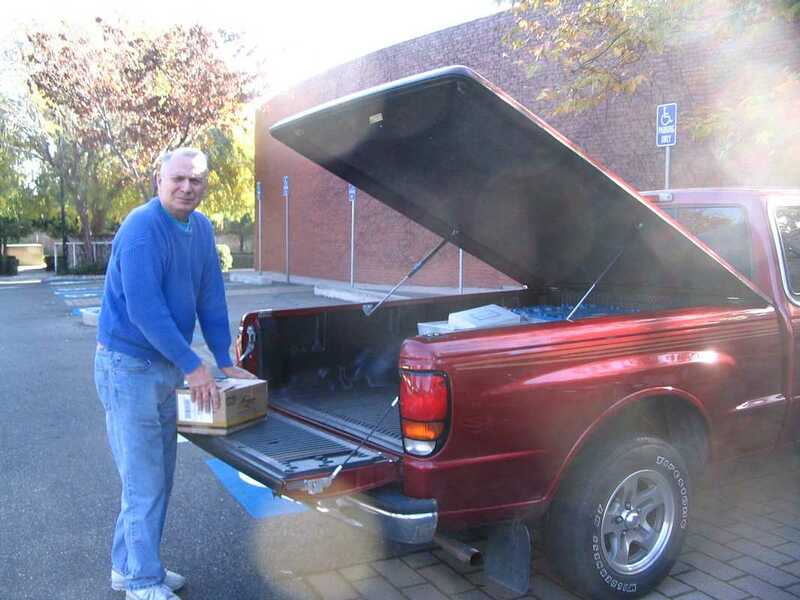 Allen Palmer arrived with his pickup loaded with re-furbished parts from Grant Savier's work shop. Here the truck is about half unloaded. So much weight (many motors and clutches) on such a little cart. 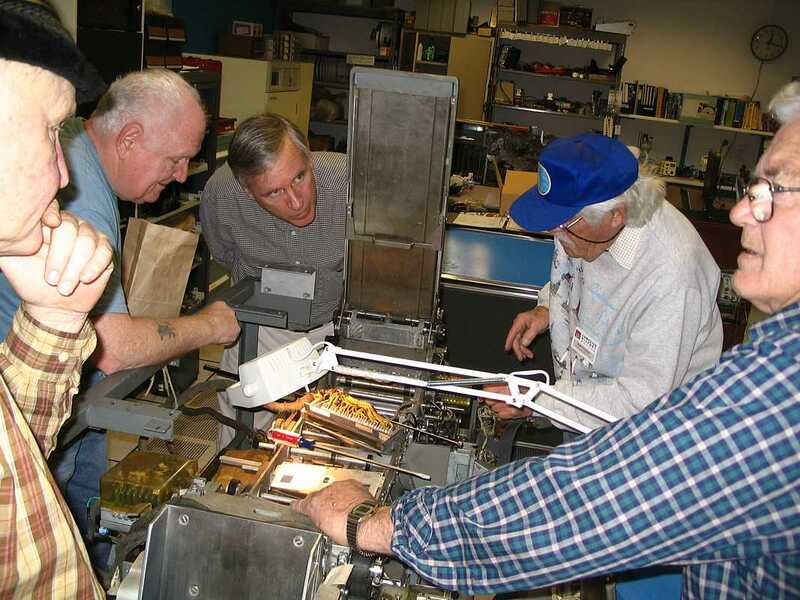 Bob Erickson and Glenn Lea continued cutting and fitting plastic shielding for the 077 collator. The general philosophy is to prevent accidental touching of moving parts, not to completely encase the 077. Randy Neff came by and worried that if people reached around the shielding, bad things could happen. The roller the brushes contact is a hard rubberoid substance, not bronze. The roller is normally at -21 volts, rising to about 0 volts during the 12 pulses of the card read cycle - the 80 write core wires in the card reader core are normally at -21 volts so maybe this might reduce hazard of smoking the limiting resistors in case of some fault. See December 4th diagram above. And a little study of the two read stations in the 1402. 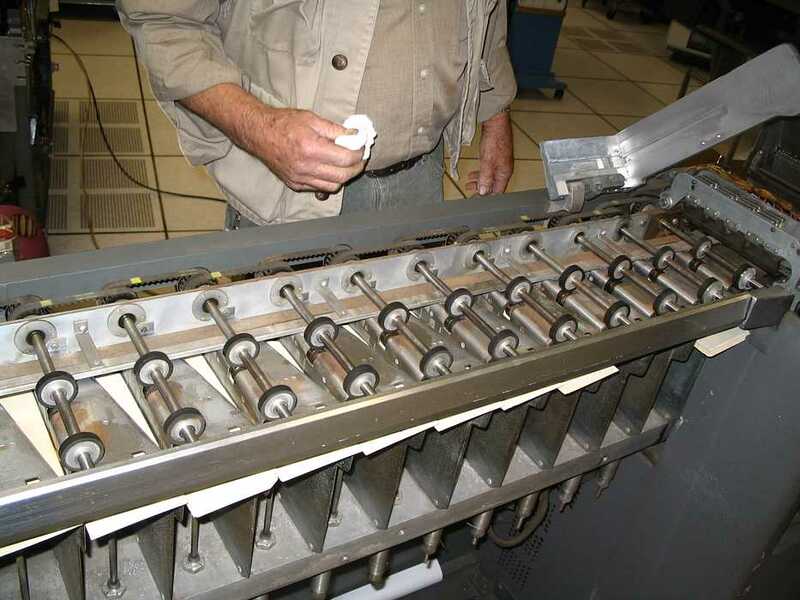 The read brush assembly of the second read station is removed for viewing. Ed talked some with Jim Sumers about the coming demo - Feb/March. He seemed pleased with the thoughts so far. Apparently the administration is contemplating demoing the operational machines (PDP-1 and projected IBM 1401) on alternate Saturdays - alternate being the PDP-1 one say even Saturdays and the 1401 on odd Saturdays - something like that? Jim was concerned about my projected visitor training time to operate a key punch to key punch their name into a card - to be read into the 1401 and printed in BIG letters, etc and a description of the 1401. (We hope to have 3 operational keypunches by formal demo time.) I had projected 5 minutes to get someone familiar with feeding a card and successfully keying their name. Jim wondered what we would do if we had say 15 visitors which might overwhelm that procedure. I showed Jim something like the following that now works with 1401 emulation under Ron Mak's ROPE :-)). This is currently coded in 1401 AutoCoder, could be recoded in the not so nice SPS format, the smaller less demanding 1401 assembler. The drive did not want to load tape today when we powered up the system. Ron found that the mercury switch behind the take-up motor had fallen out of its clip. We also found that a wire going to the supply side capstan microswitch was broken. I probably broke the wire troubleshooting the mercury switch problem. The drive worked well the rest of the day. Troubleshot the missing "Tape Error" problem that I reported last week. Found two bad cards in the TAU. Now "Tape Error" seems to perform correctly. Ran the full set of tape diagnostics. Intermittent errors still occur, but only on about 1 in every 100 records. (Backspacing and retrying the operation seems to work 100% of the time.) Often errors are reported, but the data is transferred correctly. Other times it seems that we pick or drop the 8-bit (as in C-B-A-8-4-2-1). These may be real problems or just lack of proper adjustment. It's time to fine-tune the drive adjustments. We had trouble reading the diagnostic decks. There were frequent "Reader Checks". Sometimes we had to read a deck several times to get the program to load correctly. Present were: Ron Williams, Bob Erickson, Tim Coslet, Jeff Stutzman. Ron Crane came mid afternoon. Troubles writing/reading tape drive - 8 bit dead ? where? Bob Feretich on vacation until mid Jan.
> Fantastic! How many distinct tests was this? interpret the results. The documentation did not cover the Model V drive. > Can you summarize (for the web site) what they all do? > in the course of the day? > progress on the 1402 gang read -> core problem on Weds? > of the 1402's 21V power supply. No. He did fix the addressing problem that I reported last week though. I would suggest sacrificing a goat. It always worked for me. Present were Ron Williams, Bob Erickson, Frank King, Bill Flora, Ed Thelen. Robert Garner and Grant Saviers were in the building attending high level CHM meetings. 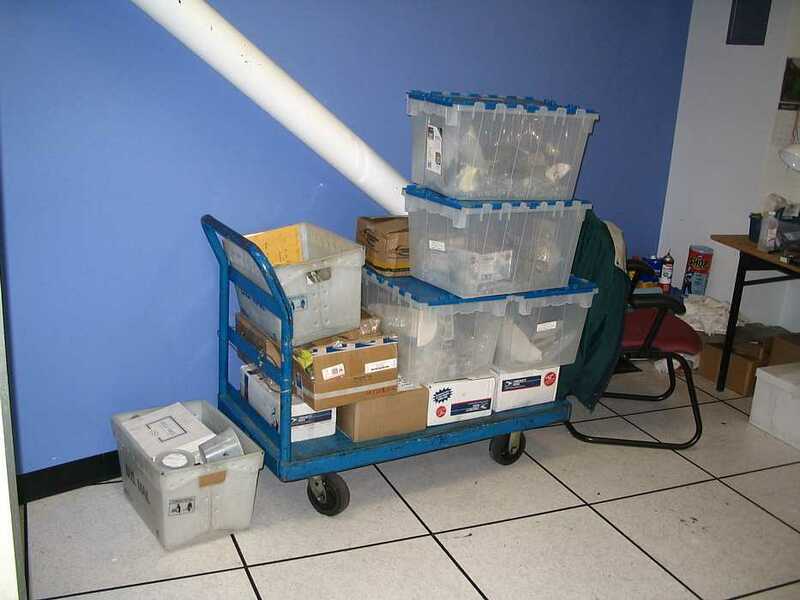 There has been a lot of focus on the brush contact rolls and power supply for a month. Today Bill Flora discovered the brushes that control the voltage to the brush contact roll (not the read brushes) were installed in the wrong direction. We believe the machine was purchased in this condition. I believe this contact brush condition has been corrected. While working on the above, Bill Flora noted that the feed rolls into and through the two read stations seemed to have detents. We all got our fingers in there and felt the very definite "detent" or negative lump once per revolution. The fiber rollers were removed, and the non-uniformity of diameter was measured to be about 0.004 inches. 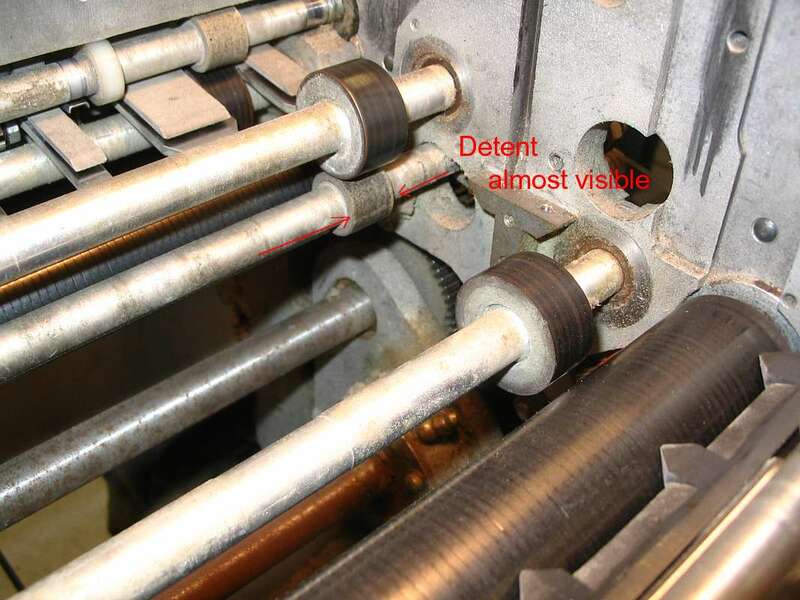 As the "detents" were cylindrical in form, and the micrometer lands are flat, it is possible the "detents" are larger. Folks estimated that reduction of radius of the "detented" fiber rollers by 0.005 inch would be good. 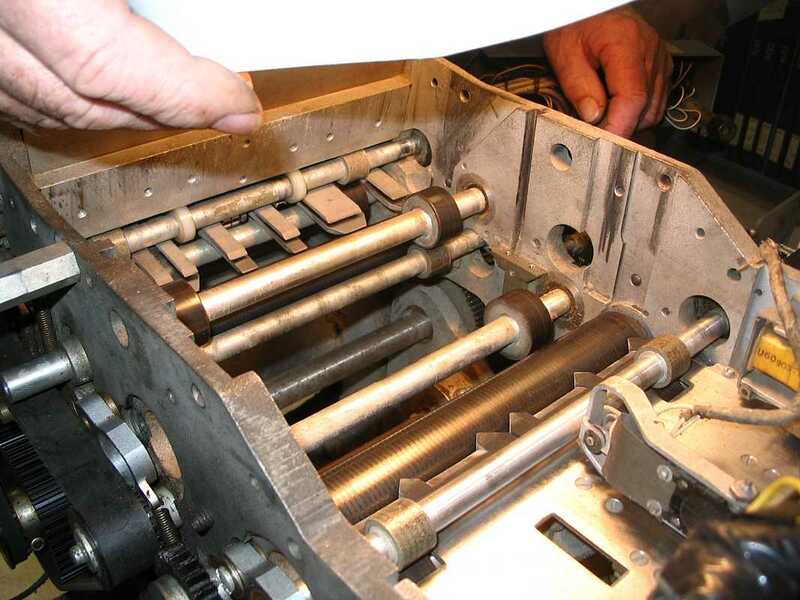 Gears were removed from their shafts by punching out the tapered retaining pins. Tapered pin removal is regarded as an art. Not enough impact on the drift (the clyndrical tool use to push on the pin) and the pin does not move, but starts to mushroom and become more difficult to remove. Too much impact on the drift, and you can bruise hole in the shaft. Bob Erickson has a jeweler's lathe, but it is not long enough to hold the roller shaft. Robert Garner called Grant on his cell phone - and Grant promised to come by later. Since Grant had not come by when we left (about 4:00), ??? took the shafts home. 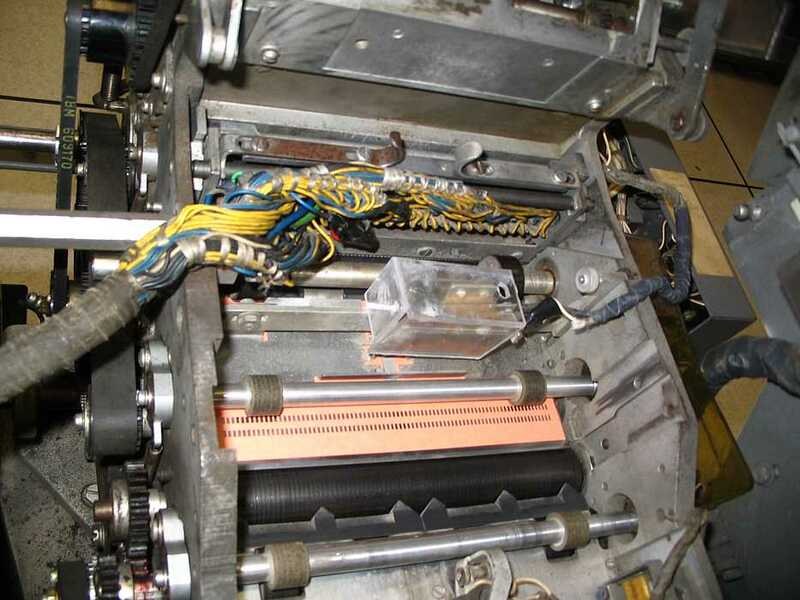 There is the continuing question as to whether the machinery of 1402 card reader/punch should be completely overhauled, as was the case with the 729 tape units. 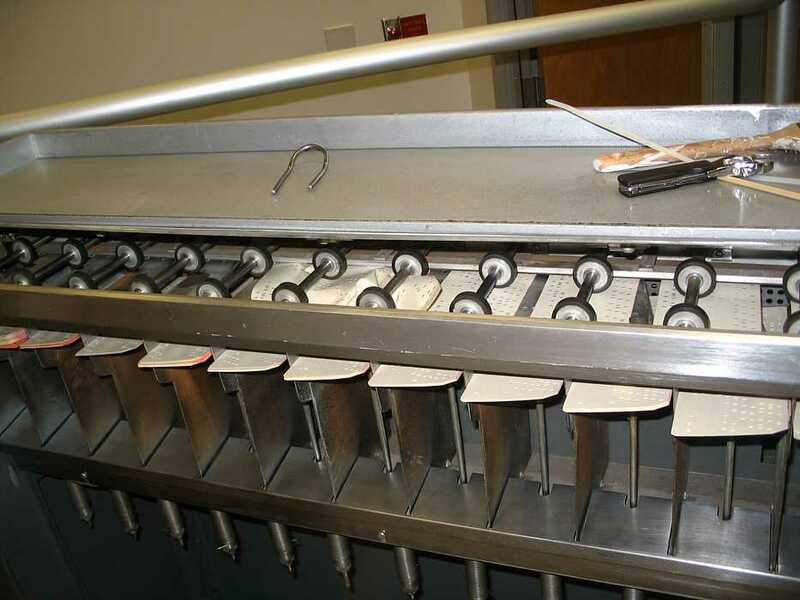 The game was to reduce the current through the pick coil during the hold operation. (It requires a lot more magnetism to pull in a relay than to hold it in the pulled-in position. That is a reason many relays use two coils.) Our pick coil is 1.2 K ohm, excited by 160 volts. The calculated power dissipation is about 21 watts :-(( I imagine as the coil heats the resistance increases - but not by enough. The target resistance of the open hold coil was about 3.3 K ohms. Lets not mention blowing the 2 amp slow blow power supply fuse while probing about. And the anguish of replacing it with the only practical fuse we had - a 5 amp fast blow. In any case we decided to place a little electric lamp in series with the jumper "we" installed between the pick and hold coil, as suggested in an e-mail, to reduce the voltage on the coil during hold time. Now - what wattage lamp?? We measured the resistance of a 7 watt Christmas bulb, and watched the cold resistance of 183 ohms rise past 200 ohms as the slight current from the ohmmeter heated the tungsten filament. - Oh boy, OK time for experimentation as we had neither the resistance coefficients nor the inclination to try to calculate and guess several unknowns. 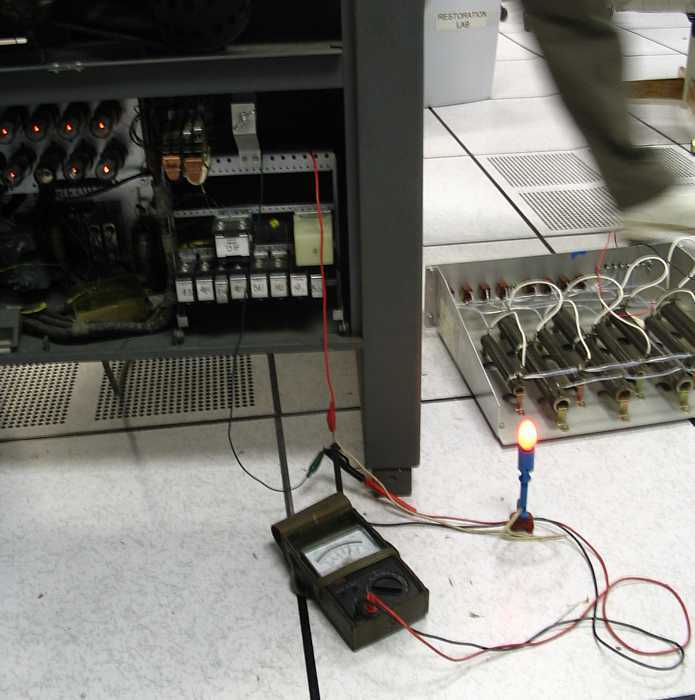 - The hold in force of the relay armature was judged "just fine" by our panel of amateurs. We also tested the above circuit with a 4 watt bulb - but the hold in force was judged "marginal". With the seven watt bulb, we seemed well within reliable, safe operating range. "We" (I) decided that we had passed ninth grade basic electricity :-)) Oh Joy!! AT LAST!! It is interesting to watch experienced CEs removing jams. The first thing is to mark the cards with their estimated sequence position - so that when the cards are removed, (and de-wrinkled and maybe re-keypunched) the deck can be ordered as correctly as possible. 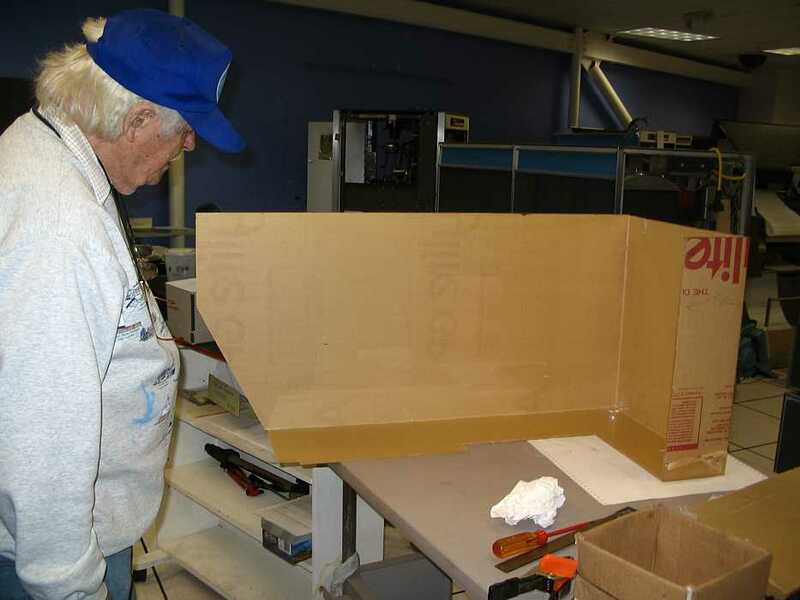 Bob Erickson continued with his project of encasing the 077 in plastic for visibility of the many moving parts, with minimal risk to fingers and neck ties. but there was an extraneous "V" at the beginning of every record as viewed in the 1401 memory and printer. Somehow, the previous contents of the tape are not being properly erased, and are appearing in following reads. Oddly, there was always exactly one and only one extra "V". ???? 1401 not being available to be powered up. so the 1401 was able to execute through the gap without a program check. you all next year. If you need to contact me, e-mail is the best way. Present were: Ron Williams, Bill Flora, Allen Palmer, Bob Erickson, Ed Thelen, Robert Garner. the Ripple Test  with no problem. Much Better !! checked for voltage and current output, has been reconnected. the appearance do not seem promising. We are getting discouraged - maybe time to call in the Pros? Ron Williams suggests that we seem to be restricted to flat plates, shields, end plates, etc. 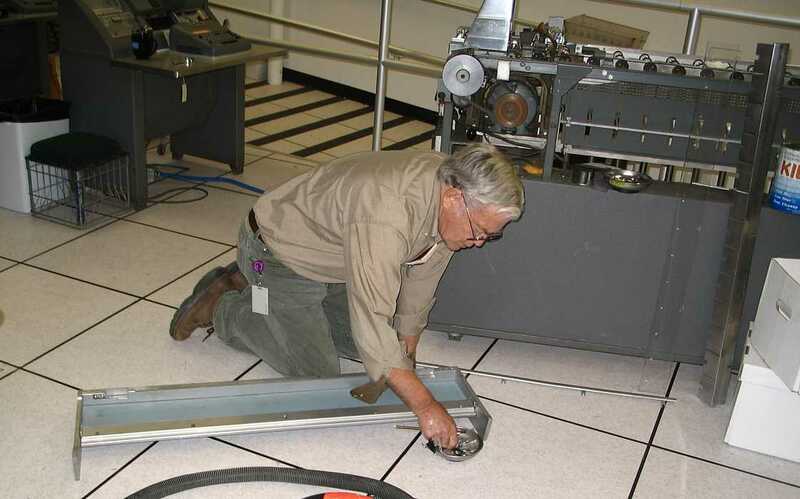 - plastic  replacing the side doors of a 729 tape drive, etc.